Locomotives with two, three and four cylinders have been commonplace. Six is unusual, but by no means unique; see the SNCF 160-A-1 Reheat Locomotive. Steam-motor locomotives tend to have a lot of small cylinders; for example the French high-pressure 232.P.1 had no less than eighteen. The record is probably held by the 1934 Bugatti proposal for a 2000HP locomotive with two 4-axle bogies, with each axle driven by an eight-cylinder single-acting steam motor, totalling an impressive 64 cylinders. This project was never built but one of the engines was, and duly tested. 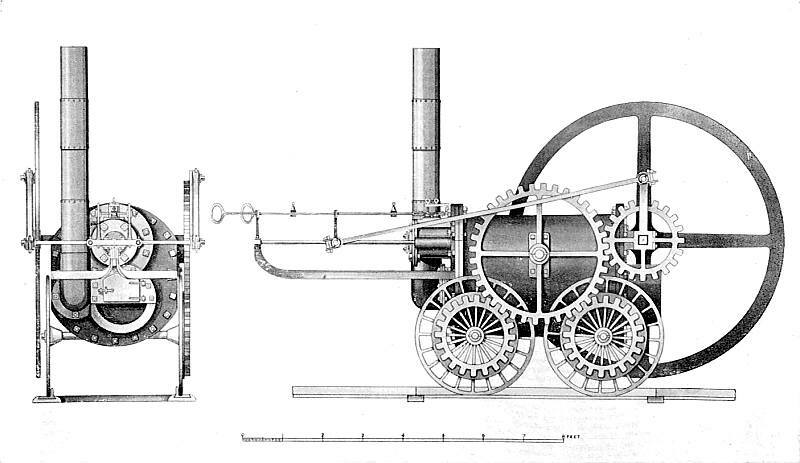 The great engineer Richard Trevithick's first locomotive had only one cylinder. It was built for him by the Coalbrookdale company, but little is known about it, not least whether or not it actually ran. The only known information is the drawing shown here, preserved at the Science Museum in London. The single horizontal cylinder was enclosed in a return-flue boiler. The axles were mounted directly on the boiler, with no chassis or frame; in view of the extra stresses this would place on a boiler already carrying a very high pressure for the period, this seems to be a bit less than brilliant design. The single cylinder with its very long stroke is embedded inside the boiler; a precocious example of steam-jacketing taken to the limit. Fueling the firebox on the move looks like a hazardous business, with the crosshead whizzing back and forth just above your head. The giant flywheel was probably designed to smooth out the power impulses from the single cylinder, and possibly also to help carry the locomotive over the dead-centres. If it did get stuck on one of them, no doubt hauling on the flywheel would have got things moving. Note the use of the big central gear to couple the wheels instead of connecting rods, and the unflanged wheels, which run outside the rail flanges. 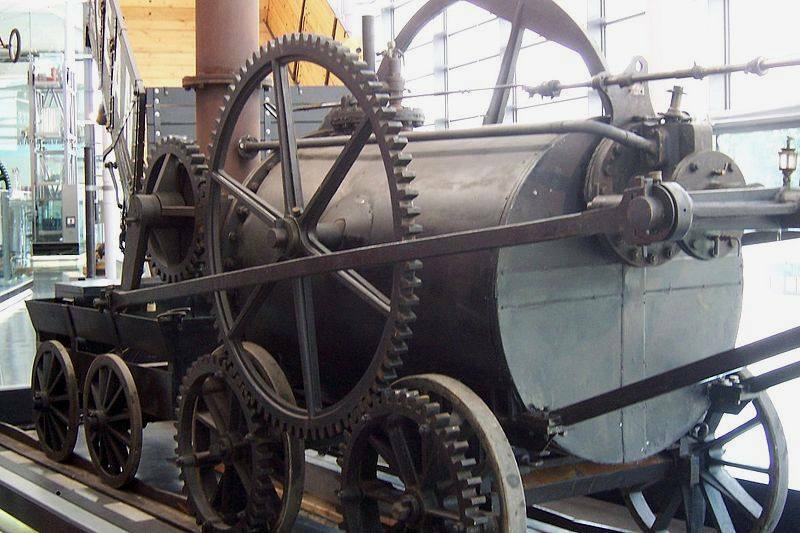 Trevithick's second locomotive was the world's first steam engine acknowledged to run successfully on rails, and it too had only a single horizontal cylinder, embedded inside the boiler. In 1802 Trevithick had built one of his high pressure steam engines to drive a hammer at the Pen-y-Darren Ironworks in Merthyr Tydfil. 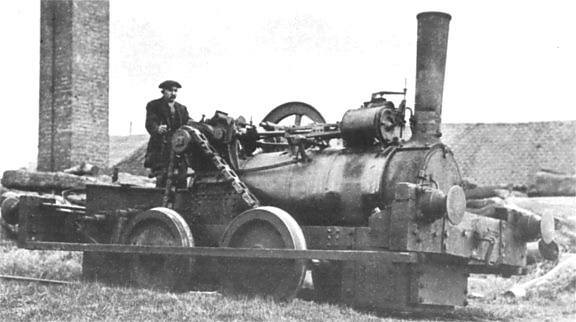 With the help of Samuel Homfray, owner of the Pen-y-darren Ironworks, it was mounted on wheels and turned into a locomotive. In February 1804, the locomotive hauled ten tons of iron, seventy passengers and five wagons from the ironworks at Pen-y-darren to the Merthyr-Cardiff Canal. During the nine mile journey the Penydarren locomotive reached speeds of up to five miles an hour. Trevithick's locomotive employed the very important principle of venting the exhaust steam up the chimney, producing a draught which improved combustion and increased the steam-raising capability of the boiler. The firebox and chimney were now at the opposite end from the cylinder and crosshead, which must have been a considerable relief to the fireman. This replica was commissioned in 1981 and is now in the National Waterfront Museum in Swansea. Note the pipe running along the top of the boiler, conveying exhaust steam from the cylinder to the blast-pipe in the chimney. Trevithick's Pen-y-darren locomotive only made three journeys. Each time the seven-ton steam engine proved too heavy and broke the cast iron rails, and the project was abandoned. The engine was put up on blocks and reverted to its original of driving hammers. 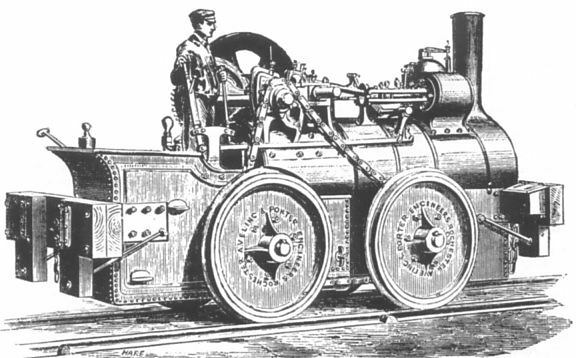 Looking at the internet, it seems very common for people to put up illustrations of the Coalbrookdale locomotive and label it" Pen-y-darren locomotive". The vital difference is that the Pen-y-darren locomotive had its chimney and firebox at the opposite end from the cylinder and extended slide-bars. 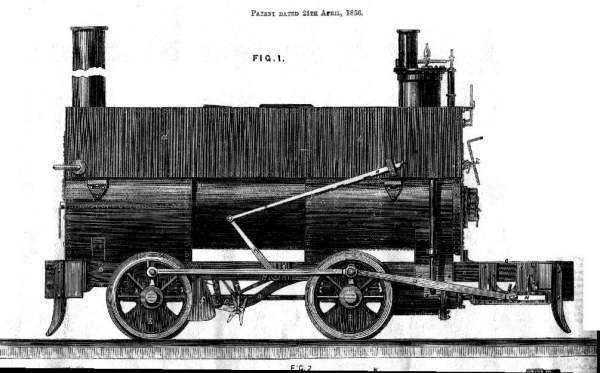 This locomotive design was built by Neilson and Company (a name we have noted before in these pages) in 1857, It was a an 0-4-0 saddle tank with a single cylinder (10" x 16") mounted under the firebox and footplate, driving a horizontal equalising beam that moved in the slots seen at the rear. A patent was granted in 1856. 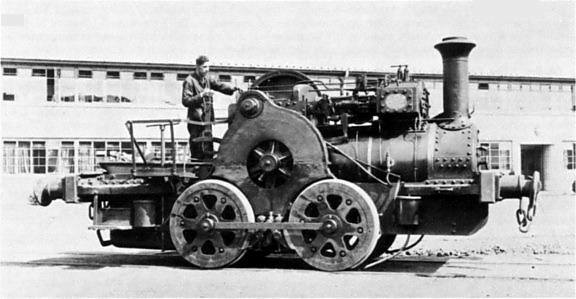 The single cylinder is placed at the rear, partly under the footplate. It is connected to a horizontal beam, each end of which drives the wheels on one side of the locomotive. The cranks on each side are set at 90 degrees, so that if one side was on a dead-centre the other would be able to move. Underneath can be seen the simple gab valvegear which would give forward and reverse but no variation in cut-off. This would need to be driven by a pair of eccentrics but these are not visible here and not shown on the drawings below. A number of these locomotives were built for shunting in the collieries and ironworks of Scotland. Presumably the power required for this was modest, and the use of a single cylinder simplified the mechanical arrangements and reduced costs. However the results cannot have been very satisfactory, as the idea failed to catch on. The horizontal beam appears to have two restraining links connected to it, but quite how these worked is not visible from the drawing. The cylinder appears to be a peculiar bottle-shape. Several correspondents have pointed out that the phasing of the cranks, as shown in this drawing, is incorrect. As Peter Davis put it: "The line drawing is incorrect of course, as the side elevation shows the left hand crank in the bottom quarter (meaning, with a r.h. lead) the r.h. crank would lie on back centre. Now the plan view shows the l.h. crank in bottom (or top) quarter and the r.h. one the same which is clearly unfeasible." 74 fire tubes 5' long. Two of these engines are said to have operated at the Mouzell haematite mines at Dalton-in-Furness These mines were operated in the 1890's by the Millom & Askham Hematite Iron Co Ltd and were partly served by a railway of nominal 3ft 3�in gauge dating from about 1850. There were six locomotives by Neilson, and at least two of them were of the single cylinder type. 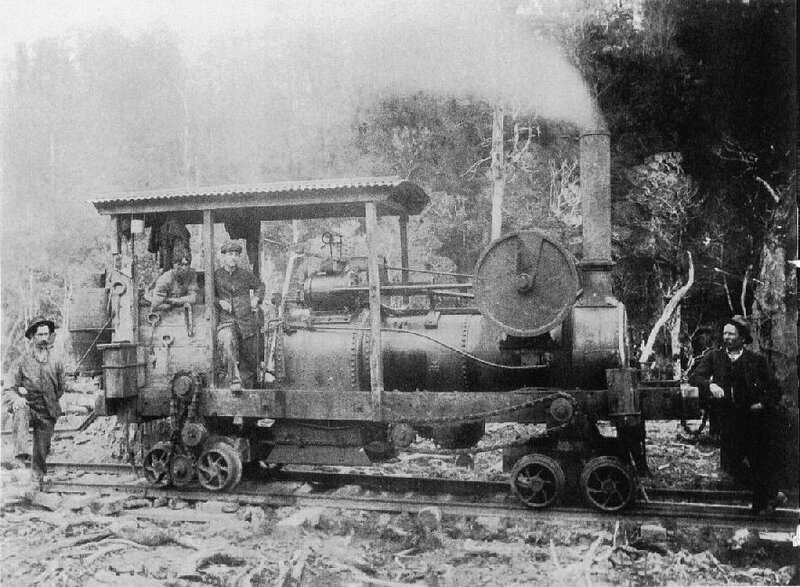 This photograph of a Neilson one-Cylinder Locomotive is dated 1855, rather than 1857 as above. It gives a good view of the rathe crude saddle-tank. The location is currently unknown, though since 'Neilson & Co, Glasgow' is written at bottom right, it may have been at the maker's works. Wherever it is it could do with a bit of a tidy-up. Thanks to Ben Burch for drawing this to my attention. According to the National railway Museum, there is a publication called "Neilson's single cylinder locomotives" by George Alliez, Librarian of the Stephenson Locomotive Society. (published by the Industrial Locomotive Society, undated) This consists of 5 pages and 1 plate. Regrettably there does not seem to be a copy available on the internet. Can anyone help? In 1881 the ten kilometer Kaiping Tramway was built from Tangshan to Xugezhuang in China, connecting coal mines at Tangshan with Xugezhuang, where a canal connected it to the river network. It was built to the standard gauge of 4 ft 8.5in. The original plan was to use mules to haul wagons, but the loads proved to be too heavy. 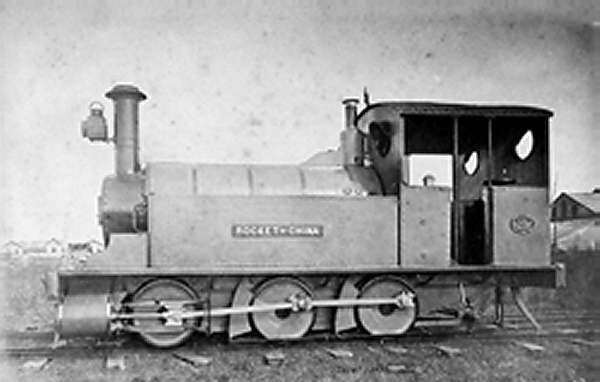 This one-cylinder engine was secretly (because of Chinese politics) improvised by the English engineer Claude W Kinder, who had organized the tracklaying. It was called "The Rocket of China". It allegedly combined the boiler of a steam crane with a frame of old iron and discarded wheels, though no sign of its crane heritage can be seen. It looks much more like a converted traction engine. It made its first test run on 9th June 1881. Presumably the problems of starting on a dead centre (and it looks like it's on one now) were solved by hauling on the flywheel. Later it was rebuilt into a working three axle tank locomotive. 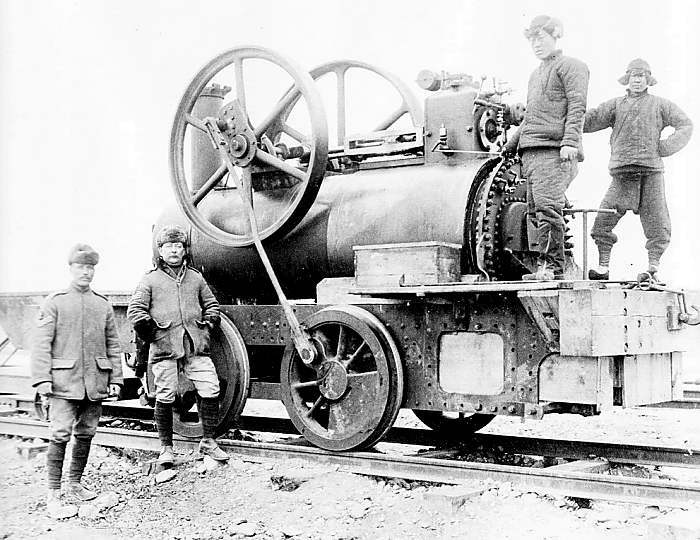 It is believed to be the first steam locomotive constructed in China. Wikipedia refers to an early 2' 6" gauge 0-4-0T engine on the Shanghai-Wusong railway, which given the uncertainties of transliteration could be confused with Tangshan-Xugezhuang, but they are not the same. The Kaiping Tramway eventually evolved into China�s first major railway line. See Wikipedia for more on general Chinese railway history. Or so we are told, but the locomotive here seems to have nothing at all in common with the improvisation above. 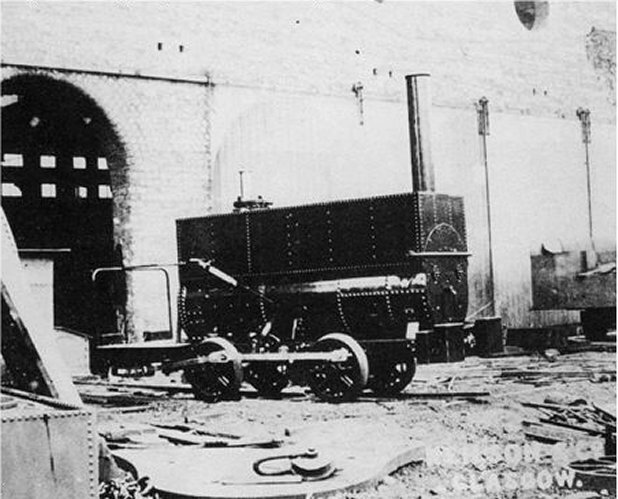 These two small 0-4-0 locomotives were built by Stephen_Lewin for the Guinness brewery in Dublin, sometime around 1877. 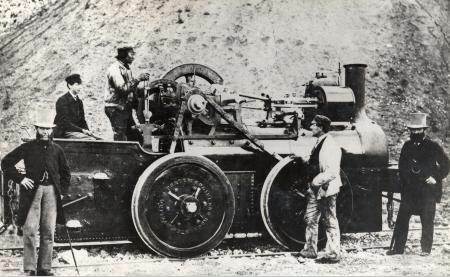 As with the Aveling & Porter engines below, they used traction-engine technology, with a single cylinder mounted on top of the boiler, and the wheels driven through reduction gearing. They were called HOPS and MALT. Intriguingly what appears to be a spoked flywheel mounted on a third locomotive is visible immediately behind MALT's brake handle, raising the possibility that Lewin's built other one-cylinder locomotives. HOPS on the left has its lighting-up chimney ready for use, while that on MALT is hinged forwards. The purpose was to give more draught when lighting the fire, as no steam would be avaialble for a blower. "We illustrate above a pair of small geared locomotives, designed and built at the works of Mr. Stephen Lewin, Poole, Dorset, for Messrs. Guinness and Co., Dublin. The engines are in every respect similar except in name; the pair being shown in order to give both elevations. Each engine has but one cylinder, 6�in. in diameter, and with a stroke of 8in. The motion of the engine is conveyed by steel gearing to the travelling wheels, which are also of cast steel. When running at 280 revolutions per minute the speed of the travelling wheels is six miles per hour. A wrought iron clutch gear is arranged on each engine, so that they can be used for driving other machinery on the premises. The piston, valve rods, and all pins are of steel. The engine is carried on a strong bed-plate, fixed to wrought iron brackets rivetted to the boiler, and suitable provision is made to allow of the expansion of the boiler. The regulator and other gear are all on the outside, and very easy of access. The boiler is made of Lowmoor and B.B. Staffordshire plate and with double rivetted longitudinal seams. The ordinary working pressure of steam is 140lb. per square inch. At the front end of the engine two buffers are fixed in the ordinary way, but the back or footplate end is made semicircular, and is provided with a radial drawbar, to enable the engine to pass with the wagons round the very sharp curves which are frequently met with on the brewery premises; the sharpest of these is 12ft. radius; the gauge is 22in. There are also several inclines on the line, the steepest being 1 in 30, and up this a load of 16 tons is frequently taken, the engines being capable of pulling a load of about 40 tons on the level. To suit Messrs. Guinness and Co.'s requirements the foot-plate has been arranged to be easily taken down, so that the engine could be placed in their hoist and lifted to another level. The total width of the engine does not exceed 4ft. over all, and the height, from top of rail to top of chimney, 6ft. and the length with foot-plate removed 8ft. The water is carried in tanks fixed between the frame plates, and the coals in a bunker bolted to the side, as shown in the illustrations." This engraving, published in The Engineer, was taken from the photograph above. Regrettably Lewin's went bankrupt in 1879. The firm of Aveling & Porter are best known as manufacturers of traction engines and steam rollers. 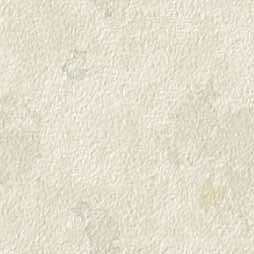 In fact, the company became the largest manufacturers of steam rollers in the world. Nevertheless, they also built locomotives, based very much on traction engine technology. Truly thinking outside the firebox. Further investigation shows no trace of any such railway on current maps; Erith and St Mary Cray are about 8 miles apart; both have railway stations but any journey between them today would have to be very roundabout, probably via London. 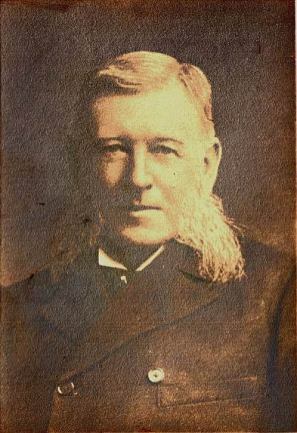 However, Charles Beadle certainly existed, and he and his brother Frank were well-known coal-merchants in Erith. Likewise there was definitely an important paper mill at St Mary Cray, though the owner's name was spelt Joynson. It was later acquired by Wiggins Teape; my father took me around the works when I was about 14. These locomotives were used for general haulage in the very considerable amount of building work that took place in this period. The unique advantage of these locomotives over conventional railway designs was that when not required for haulage they could stand still with the engine running (by disengaging a clutch) and power could be taken off to drive machinery like stone crushers and grinding mills. In 1866 another Aveling & Porter tramway locomotive was reported as under construction for the Portsmouth dockyard. "Our illustration represents one of three engines of this class supplied by Messrs. Aveling and Porter to the Grays Chalk Quarries Company, at whose works they are now regularly employed. The engine is rated at 10 horse power nominal, and has a single cylinder 10in. in diameter, with a 12in. stroke, this cylinder being fixed on the top of the boiler and surrounded by a steam jacket, as in Messrs. Aveling's other engines. From the crank-shaft the motion is communicated by spur gearing to a countershaft carrying at its end the wheel for the pitch chain, the bearings of this shaft being placed in curved slots formed in the supporting brackets, so that the shaft can be raised and the chain tightened when necessary. The crank-shaft carries a flywheel, and the engine is fitted with the usual link-motion reversing gear." Here is another picture that is slightly better in some respects. The single cylinder (7-3/4in by 10in stroke) was perched on top of the boiler, as in traction engine practice. The drive to the wheels, and their coupling together, was by a single chain; unusual in either a traction engine or a rail locomotive. The bearings for the countershaft were located in curved slots in their supporting brackets, to allow the chain tension to be adjusted. The wheels were 3ft 0in in diameter. Presumably the dead-centre problem was over come by hauling on the flywheel. Since the engines were converted from traction engines they very likely retained the clutch, so the flywheel could be disconnected from the driving wheels to make this feasible. The A&P locomotives had a top speed on the level of 8 miles per hour, (13 km/h) but in service an average of only 4 miles per hour (6.4 km/h). One was timed taking 41 minutes to travel roughly 2 miles (3 km) from Quainton Road to Wotton hauling 42 tons. They were noisy and were nicknamed "Old Chainey" by local folk. They were not noted for their reliability, and when pulling a heavy load their front wheels would lift off the track. In 1876 they were supplemented by conventional locomotives bought from the locomotive firm of W. G. Bagnall; presumably these were of an acceptable weight. One of the locomotives (No 807) was sold to the Nether Heyford Brickworks in Northamptonshire, in 1895. It worked there until it was withdrawn from use in 1940; not a bad record for an unconventional design. No information is available beyond that of the image itself. The clothing is Victorian, but the date and place are unknown. There is no cab, so this may have been after transfer to the Nether Heyford Brickworks. Note that the chimney is much shorter than the railway version, and also shorter than that in the 1936 picture below. No 807 is pictured here at at Nether Heyford Brickworks on 11 April 1936, having lost its cab. Despite its unorthodox design it was clearly a durable machine. The drive by a single enormous chain can be seen in this view; the box under the front of the boiler is a water tank. No 807 seen from the flywheel side. Aveling & Porter made a number of steam locomotives, the customers including Chatham, Devonport, and Portsmouth Naval Dockyards. A complete list can be found at lukebridges.co.uk. Sirapite (No 1658) was built in 1906, and can be seen in action on YouTube. This is a compound design, with high and low-pressure cylinders. 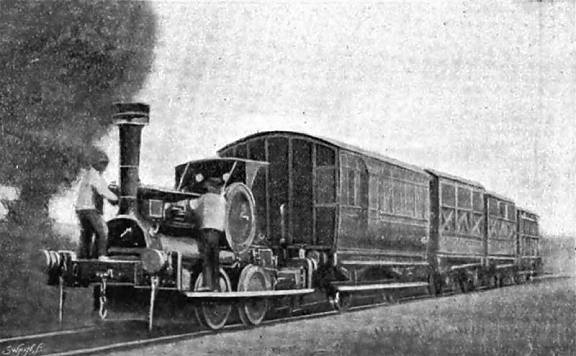 While it is not a single-cylinder machine, it certainly qualifies as an unusual locomotive, if only because of its interesting drive system which is reminiscent of the two Trevithick locomotives above. A large central gear wheel drives both axles. The horizontal member between the two wheels is not a coupling rod; it is connected to the two axles. Its purpose is uncertain at present. Pictured at Aveling-Barford Ltd, Grantham, on 3 July 1937. Left: Aveling & Porter locomotive No 9449 "The Blue Circle"
Fergus is a royal blue railway traction engine, one of the characters in the Thomas The Tank Engine canon. He is known as "The Pride of the Cement Works" because of his years at the Sodor Cement Works. 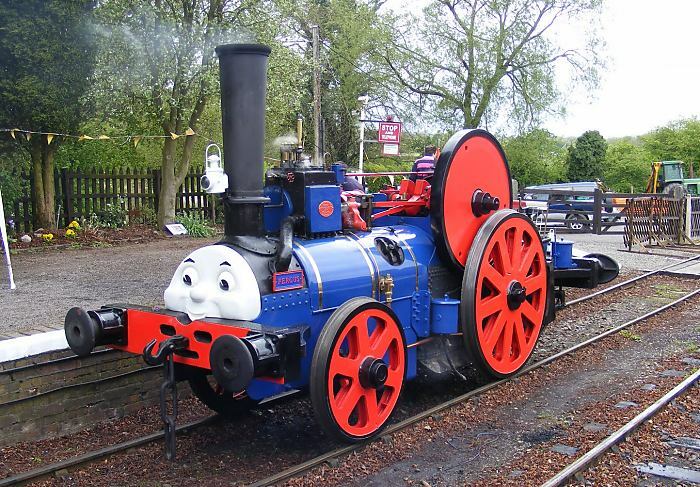 The character is based on an Aveling & Porter traction engine called "The Blue Circle" preserved in working order on the Battlefield Line Railway. It is so-called because it is near Bosworth Field, the location of the final battle of the Wars of the Roses. Here "The Blue Circle" is dressed up as Fergus. Personally I find locomotives with huge leering faces rather frightening. Must be a touch of Coulrophobia. 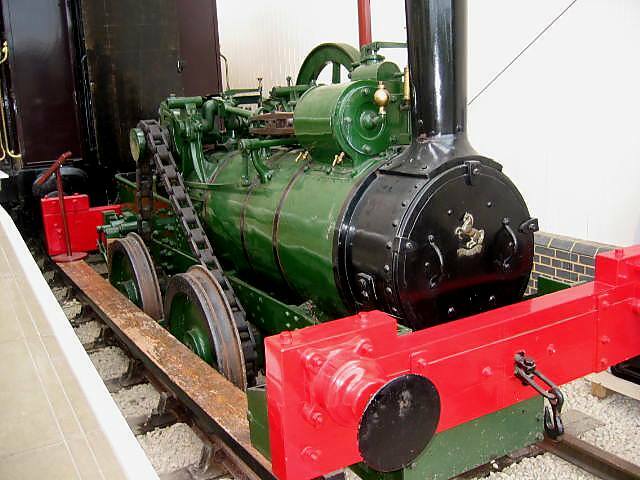 This is the only Aveling & Porter locomotive found so far with unequal-sized wheels. 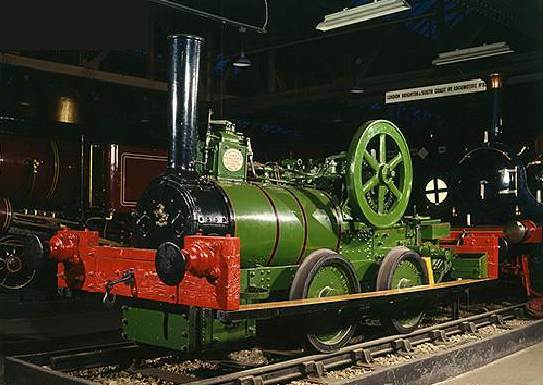 This remarkable locomotive looks like an adaption of an ordinary traction engine. The drive arrangements are rather mysterious; on the left there is a chain drive to the rear wheels, probably taken off the original position of the traction-engine's rear axle. On the right there is another chain running between two unknown points, possibly driving the front wheels. The location is Seddonville, an area on the West Coast of New Zealand's South Island, once an important coal-mining district. The locomotive may have been used in mining, but might equally well have been involved in logging. Exact location and date unknown. 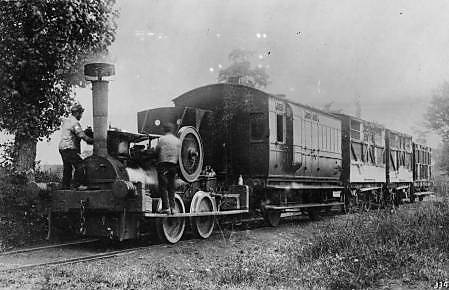 "There was an example of a one-cylinder locomotive in the 1850's here in Australia. If you get to read a copy of Locomotives of Australia by Leon Oberg you'll see it. Off the top of my head I believe it ran on the Hobson's Bay line, and was constructed from bits of construction wagon, pile driver engine and a locally made boiler. On the first day it ran into the classic problem of single-cylinder engines and managed to find dead-centre. It had to be pushed along by hand a little before it could move under its own steam. This was back in 1854, so it was a good early example of ingenuity."